When considering home design, many people spend lots of time deciding on the style of the interior and exterior of the house, but most forget to consider the garden. The garden is the final accessory to creating the ideal house design, and there are a number of features that can be used to emphasize the natural beauty of the garden, which in turn will accentuate the house. 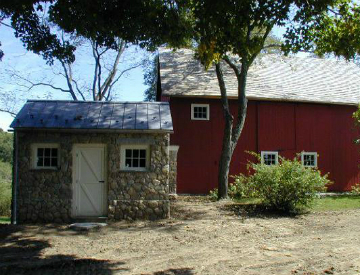 Add a Focal Point to Your Backyard With a Beautiful Stone Potting Shed. Each garden needs a focal point, whether it is something that’s attached to the house, like a terrace, or an arbor that will add elegance and softness to your outdoor space. If you are the type of person that loves pottering about in the garden, consider a stone potting shed as your garden focal point. A stone potting shed not only adds a touch of class to your garden, it will be invaluable as a place to store your garden tools and various odds and ends. Many people will consider a garden shed as something of an eyesore, to be hidden away in the corner of the garden and only approached when necessary, but in the capable hands of designers such as Tiefenthaler, you’ll find a shed that exceeds you expectations. Not only will it be beautiful to look at, and add an extra dimension to your outdoor space, it will be functional and stylish on the inside, allowing the avid gardener plenty of space for everything they need. If you aren’t a gardener, you can use the stone potting shed as a room, and the design can incorporate a number of features depending on how you want to use the space. No matter what your needs, finding a reputable contractor is your first step in achieving your design goals. Contact us today to arrange for a consultation time that suits you best.